Where museum visitors become inventors! Spark!Lab opened at the National Museum of American History in 2008 and was one of its most popular attractions until it closed in 2012 in preparation for the renovation of the museum’s west wing. Spark!Lab reopened at the National Museum of American History in 2015. In an effort to show that invention is more than just that “Aha!” moment, Spark!Lab provides visitors with opportunities to explore the invention process and their own inventiveness through a variety of interdisciplinary, hands-on activities. In an engaging and exciting environment, Spark!Lab demonstrates the central role that invention plays in American history. Now, through Spark!Lab’s National Network established in 2011, a community of museum professionals dedicated to fostering inventive creativity brings this experience to families in their own neighborhoods. (Click here for Network contract details). 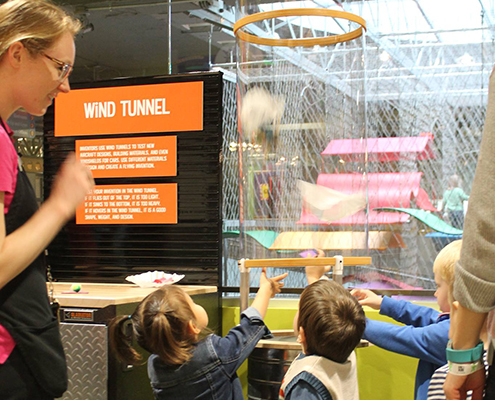 Science City at Union Station Kansas City (Kansas City, Missouri) Spark!Lab opened at Science City in August 2014. See how young people interact in the space in the video below. Press clipping from the opening event here. 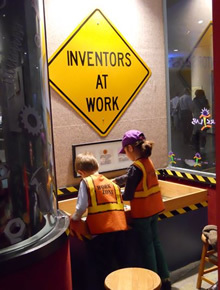 Children enjoying the process of invention at The Children’s Museum of the Upstate. Photo credit: TCMU. For more information on bringing Spark!Lab to your neighborhood, contact your National Outreach Manager. The Lemelson Center for the Study of Invention and Innovation invites children between the ages of six and 12 to create, collaborate, explore, test, experiment and invent. Activities for children and families incorporate traditional science, technology, engineering and math (STEM) with art, museum and creativity. The center is supported by The Lemelson Foundation, a private philanthropy established by one of the country’s most prolific inventors, Jerome Lemelson, and his family. The Lemelson Center is located in the National Museum of American History. For more information, visit http://invention.smithsonian.org.